I did a lot of radio interviews when my book Witness Tree came out and sure enjoyed that. Here is a pod cast with Wyoming Public Radio that really captured the joy of the Witness Tree story, seeing the extraordinary in the ordinary of that red oak tree — and the truth of the climate change story revealed in nature. As New England has endured its snow bomb it’s been weirdly warm here in Seattle, where I live, just as it was when I was at the Harvard Forest writing Witness Tree in the winter of 2014-15. We had snowmageddon at the Harvard Forest while back home people were cutting the grass by March. This year seems to be headed in a similar direction, friends are already hearing spring frogs south of us and the daffodils are up four inches. The witch hazel in our front garden is in full bloom. The big oak has made it through the bomb cyclone and I’m glad for that! I’d show you the picture on the Witness Tree web cam at the Harvard Forest of it standing tall…but the cover over the camera is covered with snow! As it should be. Meanwhile tree stories continue to fascinate me. 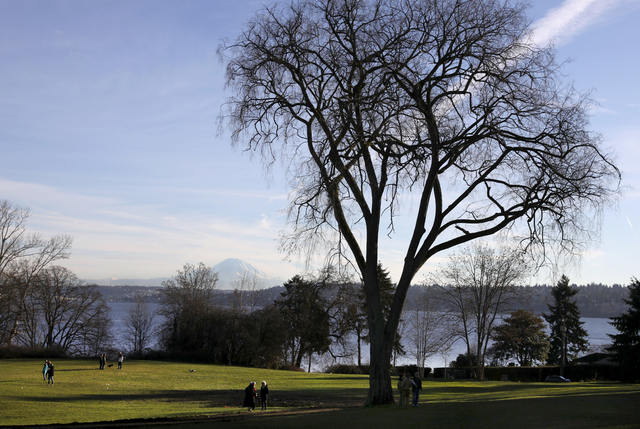 Here is a piece I wrote in the Seattle Times last week about the death of a beautiful, old American elm. It stood for a century and now only its mate remains, its crown holding the shape of the departed. As in any long marriage, they formed one another and the remaining elm shows the reach of its mate’s arms, where they stood together side by side, for so long. As elsewhere, the elm had been maintained with expensive injections of anti-fungal treatment to stave off Dutch Elm Disease, and was perfectly healthy. But the soil became so saturated in one of our famous Seattle winter rains that a winter wind storm at the stub end of the year blew it right over. One of the things that made that big elm so special was its crown tumbled in green tresses all the way to the ground. So people could touch and know the canopy even of a very big tree. Here it is, still standing with its mate, as it received what turned out to be its last treatment. The elm on the left was toppled in a wind storm. 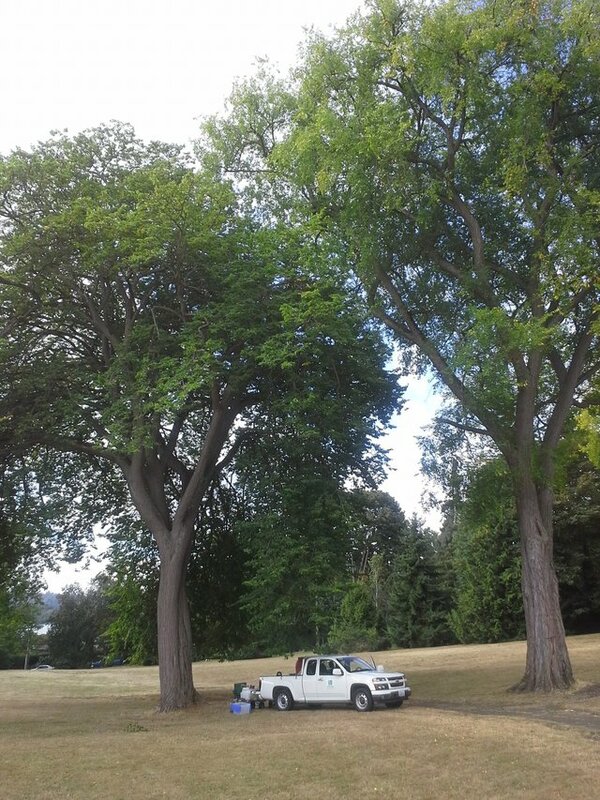 It was one of the largest American elms left in Seattle’s city parks and sustained with anti fungal treatments, such as it is receiving here. Photo by Deborah Brown McGarry.